Return to the How to Install Crown Molding page. Visit the Crown Molding department. 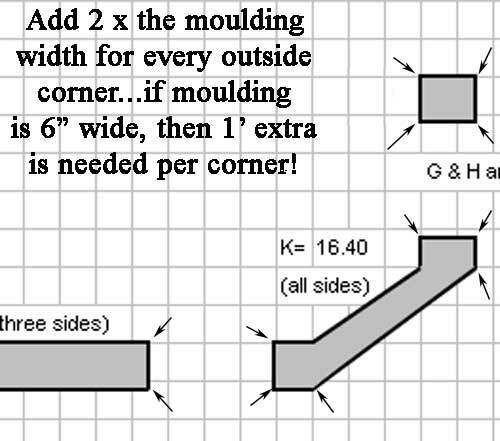 Measuring for your moulding project is not difficult, but you should know a few tricks of the trade. While many rooms are simple rectangles, and measuring the perimeter is pretty easy, you many encounter columns, unusual shapes, etc. 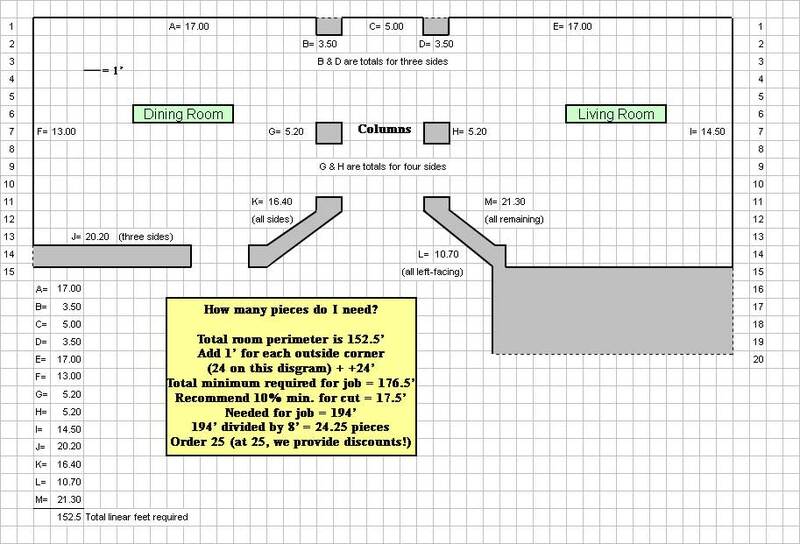 The below diagram was submitted by one of our customers, and he correctly measured his perimeter...but did not consider that every outside corner takes more material...and he has many outside corners...24 to be exact. So, he did not add in the added 24' he would need with his moulding order. As a result, he probably would not have ordered enough moulding, even adding in the recommended 10% extra. So..keep in mind that while inside corners require actual measurement, every OUTSIDE corner requires MORE material. 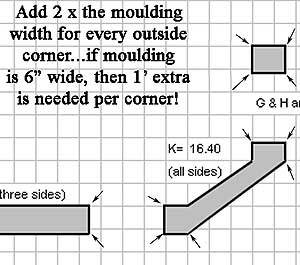 It is less expensive for you to order the correct amount of moulding pieces than to be caught short a few pieces and have to pay for additional shipping! 3 - Combine and then add 10% for safety! Special thanks to our good customer, Rich Scott, for allowing us to use his diagram for our demonstration!